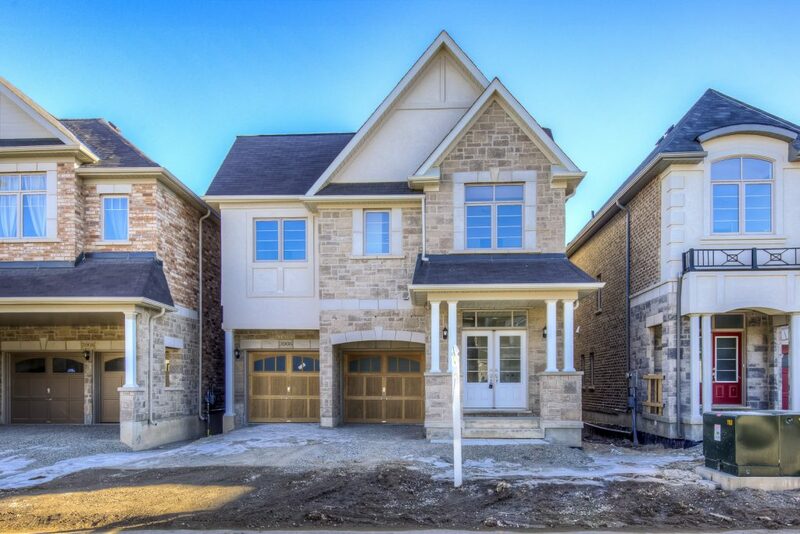 Newly built in Burlington’s Alton community, 3906 Tufgar Crescent is a modern, sophisticated home with thoughtful finishes and a spacious design. Over 3000 square feet, the unique features include a gorgeous loft and a second-floor laundry room, plus each bedroom has an ensuite bathroom. Maple flooring, large windows, and coffered ceilings in the dining room create an elegant, spacious appeal. The great room is comfortable and welcoming with fireplace. The great room opens up into the kitchen, which boasts custom cabinetry, quartz countertops, a central island, and stainless steel appliances. The breakfast area is bright and cheerful, with patio doors that lead to the backyard. Coffered ceilings are a distinctive feature in the master bedroom, which also includes a walk-in closet and a five-piece ensuite bathroom. The ensuite has double sinks and a built-in tub beside a wide window. Two additional bedrooms share a Jack-and-Jill bathroom, and the fourth bedroom has an elegant four-piece ensuite bathroom. The third-floor loft is full of natural light, provided by two large skylights. A fifth bedroom is located here, with generous closet space and a five-piece ensuite. This is an enviable second master bedroom that boasts privacy and elegance. Tufgar Crescent is located in a residential neighbourhood in Burlington, Ontario. It is close to the intersection of Walkers Line and Dundas Street, close to a variety of shops, restaurants, and local amenities. Oakville Trafalgar Memorial Hospital is only a few minutes away, and this location is easily accessible by major commuter routes and public transit. This family neighbourhood is close to a number of schools, including Rolling Meadows, M. M. Robinson, and Corpus Christi Catholic Secondary School.